I started the website Contacts Advice because I saw that there was huge number of people choosing to buy their contact lenses online to save money. But even when people thought they found the cheapest site for contact lenses, they were still paying a lot more than they should. This happens because there are dozens of websites that sell contact lenses online and they all claim to have the lowest prices. However, this is far from the truth. In fact, they are all deceiving you, because there is no site that is the single cheapest place to buy contact lenses online. If you want to pay the best price for you contact lenses, you have to consult a contact lens price comparison site, such as Contacts Advice. There is no question that shopping for contact lenses online is cheaper than shopping for them at you eye doctor’s office. 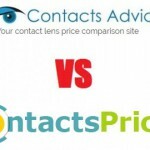 But just because you’re buying your contact lenses online, does not necessarily mean that you’re getting the best price. Nowadays, there are more websites that sell contact lenses than I can even keep track of anymore. And they do no all charge the same price for their contacts. There are many different factors that go into what these sites end up charging for their contact lenses, but the bottom line is that the online marketplace is wild and highly variable, and you have to be just as vigilant and skeptical when you shop online as offline. This is the number one reason why you will never find a single site that has the lowest prices on all brands of contact lenses. When you find a site with really low prices for certain brands, rest assured that they make up for it by overcharging for other brands. 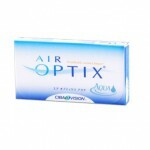 In the example above, we see prices for Air Otpix Aqua at Lens.com and Walmartcontacts.com. 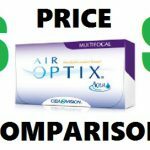 A single box of Air Optix Aqua costs $12.76 more at Walmart compared to Lens.com. For a year-supply, that’s 4 boxes, meaning that you would spend an extra $51.04 for the exact same product just because you didn’t know where the lowest price was. But that doesn’t mean that Lens.com is the best site for all contacts. Let’s take a look at another example. Here you can see the price for the Bausch + Lomb ULTRA at 1800contacts.com and Lens.com. 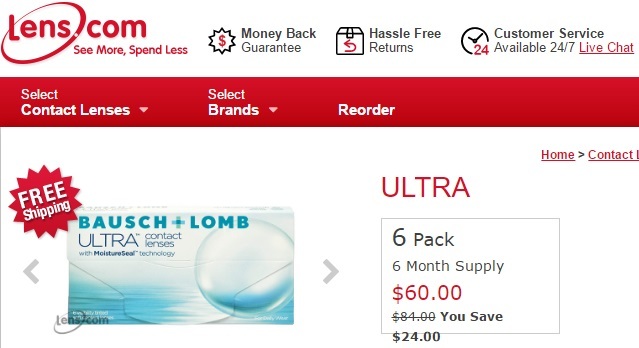 A single box of ULTRA costs $3.00 more at Lens.com, but when you order a year-supply, the price at 1800contacts drops to $42.00, making it a $18.00 difference per box. Multiply that by the 4 boxes that you need to make up a year supply, and that’s $72.00 that just spent for nothing! As you can see, Lens.com has the best price for Air Optix Aqua, but over-charges for ULTRA compared to its competitors. But Lens.com is not the only site that does this. Let’s look at a different example. 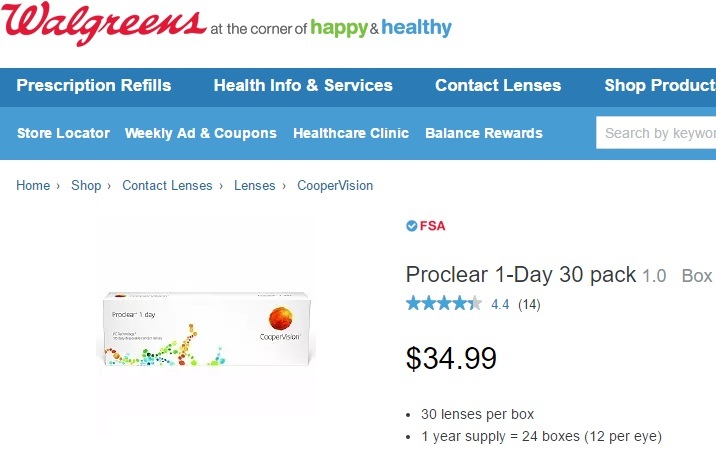 Here we see the price for Proclear 1 Day 30 Pack at ContactLensKing.com and at Walgreens.com. A single box of Proclear 1 Day 30 Pack costs $15.54 more at Walgreens compared to ContactLensKing. That’s almost twice the price! For this brand, ContactLensKing has the lowest price, but that’s not the case for every brand. Take a look at the following example. 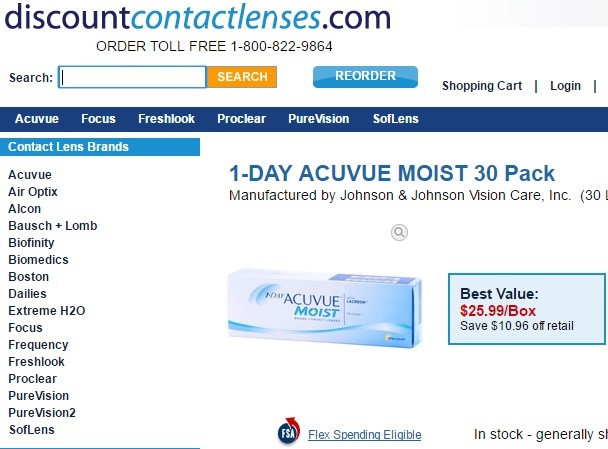 Here we see the price of Dailies AquaComfort Plus 30 Pack at DiscountContactLenses.com and ContactLensKing.com. 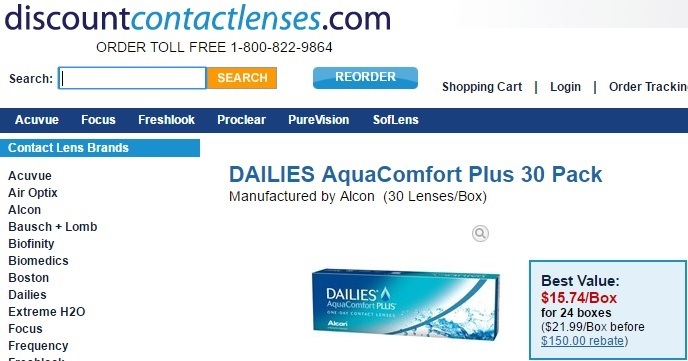 A Single box of Dailies AquaComfort Plus 30 Pack costs $3.96 more at ContactLensKing, but when you order a year-supply, the price at DiscountContactLenes drops to $15.74, making it a $10.21 difference per box. Multiply that by the 24 boxes that you need to make up a year supply, and that’s a different of $245.04! Above we see just a few examples, but the same is true for every single brand. This being the case, it is futile to look for the best site, as every site has good and bad prices depending on the brand. Instead, what you should be doing is looking for the lowest price for your specific brand. That’s what consulting Contacts Advice can do for you. I compare the price of all the top contact lens brands, across the top 10 contact lens websites to uncover where the best price can be found for each individual brand. Now you can buy contact lenses online and rest assured that you won’t pay a dollar more than you have to. Throughout the years that I have been doing contact lens price comparisons, I have seen this happen many times. From one day to the next, all of the prices on certain sites will have changed. Some prices will have gone up, and some down. It’s very unpredictable, and strange. The frequent change in contact lens prices seen across most contact lens websites is not a response to changes in the prices set by the manufacturers. Contact lens manufacturers have a set pricing schedule that doesn’t change nearly as often as the prices on contact lens retailer websites do. How exactly contact lens websites decide to price their contact lenses, and what causes the prices to change so often, I do not know. But, it hardly matters to you because all you have to do is consult my Contact Lens Price Comparison Speard Sheet to discover where your brand is currently being sold for the lowest price. 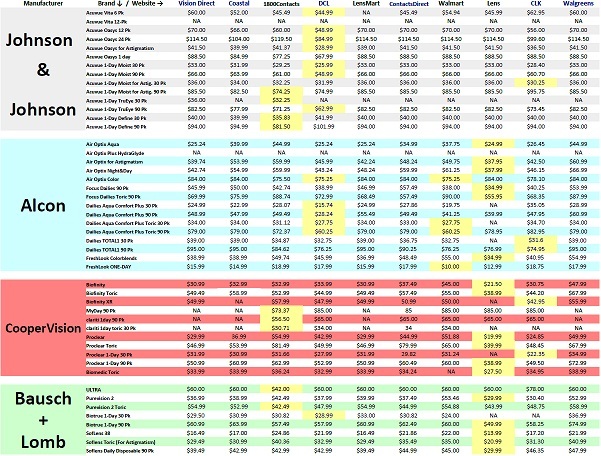 To make sure that the prices you find on my Contact Lens Price Comparison Speard Sheet are up to date, I update it daily. It never takes me more than 3 days to cycle through every single brand from every manufacturer across all the sites. It keeps me busy, but I get it done so you can save money. Not all contact lens websites are created equal. Whereas some sites might have the lowest price for a few brands, some sites never have the lowest price on any brand whatsoever. These are good sites to avoid, as anything you buy from them you would be able to get cheaper elsewhere. Are There Any Reasons Not To Buy At The Lowest Price? Some sites offer you other incentives that can outweigh the fact they don’t have the lowest contact lens prices. One such site is 39dollarglasses.com. This site generally doesn’t have the lowest prices compared to other sites like discountcontactlenes.com, but what they do offer is a free pair of glasses valued at $39 for every purchase of 1 year supply of contact lenses. This means that, if by paying the lowest price, you don’t end up saving more than $39 compared to what you would be paying at 39dollarglasses.com, then you would actually save more by getting the free pair of glasses, assuming that that’s something you need of course. 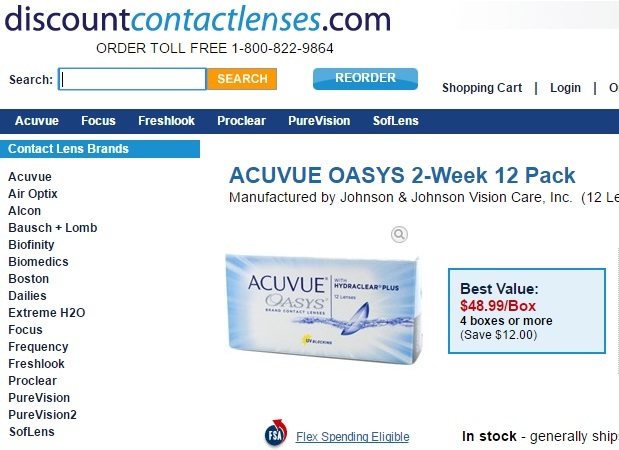 In the example about, we have Acuvue Oasys 12-pack at DiscountContactLenses.com (the lowest price), and at 39dollarglasses.com. The difference in price for one box is $16.96. Since You need to 2 boxes to make up a year-supply, that’s a difference of $33.92. 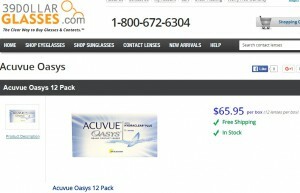 In other words, a year supply of Acuvue Oasys 12-pack would cost you $33.92 more at 39dollarglasses.com compared to discountcontactlenses.com, but on the other hand you would get a free pair of glasses valued at $39. Therefore in the case (if you need a new pair of glasses), it would save you money to buy at 39dollarglasses.com, even though they don’t have the lowest prices for contact lenses. 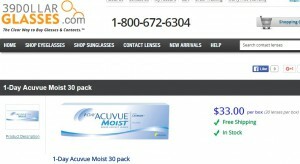 In this example, the cost of 1-Day Acuvue Moist 30-pack between discountcontactlenses.com and 39dollarglasses.com is $4.01 for 1 box. Since you need 12 boxes to make up a year supply, that’s a difference of $48.12. In this example, it would be best to buy from discountcontactlenses.com even though you would get a free pair of $39 glasses at 39dollarglasses.com. Another situation where you may not necessarily save the most money by purchasing contacts at the lowest price is if you have vision benefits. There are not currently many sites that will allow you to claim your vision benefits online, but contactsdirect.com does. There is no point in spending your own money on contact lenses, even if you are getting the lowest price, if you could be spending your insurance benefits. In that case, I would strongly recommend contactsdirect.com.